Enrico Taglietti’s proposed line quarantining the lakeshore from private development (blue dots represent proposed lagoons). Image: Supplied. One of Canberra’s most celebrated senior architects has directly challenged the City to the Lake and West Basin plans, warning against allowing “private profit masked as beneficial development” to alienate ordinary citizens from the lakeshore. Enrico Taglietti was speaking at a symposium held in his honour at the National Gallery as part of the Design Canberra festival, in conversation with his longtime collaborator, Gianmatteo Romegialli. They’ve proposed a line around much of the current shoreline beyond which no private development would be allowed. Their boundary line would block much of the proposed West Basin development, reserving it for parkland and public use and preventing “building for profit”. Mr Taglietti, who is a past winner of the Royal Australian Institute of Architects’ gold medal, said he believes that West Basin should be “kept free of interference”, and is “very concerned” by some of the Kingson Foreshore development as a model for what could happen elsewhere. 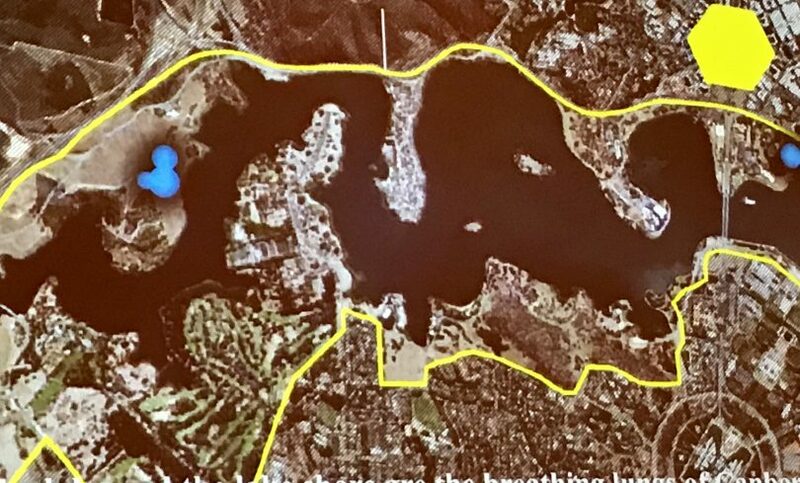 “The lake and the lakeshore are the breathing lungs of Canberra,” Mr Taglietti said, in a presentation that also called for population inside the original Canberra planning envelope to be limited to 100,000, moving further growth to the town centres. He conceded that he would be open to changing his mind if the design work “was done properly,” but is concerned that lakeside development risks creating a space that’s “polluted and impossible to enjoy because everything is about making money, and that should not be the case”. Alternatively, Mr Taglietti has proposed a “lagoons to the city” model (pictured in blue on the map) which would indent waterways and lagoons, pushing development back from the Lakeside itself. The UNESCO-linked International Council on Monuments and Sites (ICOMOS) called on the Territory government in May to immediately cease proposals for waterside apartment complexes as part of the West Basin development and asked the government to ensure that “the inclusion of Lake Burley Griffin and Lakeshore Landscape to the National Heritage List is progressed without further delay”. 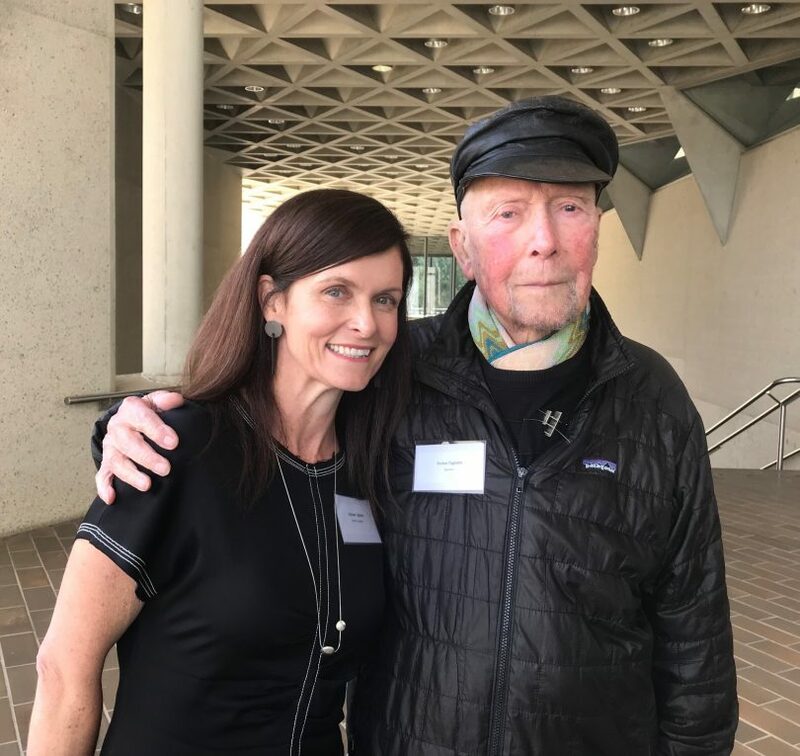 Acclaimed Canberra architect Enrico Taglietti with Design Canberra CEO Rachael Coughlan. Photo: G Jacobs. It’s a stance that resonates with Mr Taglietti, who first came to Canberra in the 1950s, and whose work has been acclaimed internationally. Notable Canberra buildings include the Dickson Library, the Polish White Eagle Club, the Apostolic Nunciature, the Italian Embassy and many private houses as well as major commissions interstate. He believes that development priorities for the city should match the criteria for world heritage listing, aspiring to “be a masterpiece of human creative genius; be an important interchange of human values; bear exceptional testimony to our culture and be an outstanding architectural, technological and landscape ensemble”. The original vision for West Basin included a sports stadium, aquatic centre and convention centre, but more recent iterations of the plan have scaled back those elements considerably, focusing instead on residential development and a waterfront promenade for retail and restaurants. Critics including the Lake Burley Griffin Guardians say the public will lose seven hectares of Acton Park and 100 trees for the apartment development, effectively privatising the lake vistas. The ACT government, however, has said repeatedly that they believe improvements to West Basin are consistent with the requirements in the National Capital Plan and will strengthen the cultural and heritage value of the lake. Should the West Basin development go ahead? Definitely no more development around our lake ...it belongs to us all and we should have access to enjoy it !! Agreed. It is possible to strike a balance between parkland/open space and the built environment. Canberra still has a way to go before it matures into a modern international city. There just seems to be a knee-jerk reaction by some groups against any development. I hate the old NIMBY term as its a misnomer in so many cases, but this is a perfect example of Nimbyism at its best. Not saying what is proposed is the optimal solution, but it doesn’t take much to see what a waste the West Basin area currently is – its a prime location that should be far better utilised, whether for development or something else. Enrico makes a good point. The privatization of public space changes the look and experience of our city - forever. Once we give up our cherished views into, around and across the lake, we will lose our sense of our place, our city and our story. The lake is central to Canberra's identity ...and not only belongs to every Canberran but to every Australian and we as the custodians really need to engage with that idea more than we are currently. This is a place which should be cherished for the fact that it exists in such a beautiful landscape setting and should never stoop to the poor quality of ideas, form and experience that is the concrete bathtub known as Kingston Foreshore - the original idea of which has been continuously compromised to the point that the development fails on so many levels - failings which can never really be rectified as there is no space to do so. The risk with the privatisation of West Basin's public landscapes is that it risks becoming another development which compromises the very elements which define it. Perhaps we should identify why we need this development at this time and then follow a rigorous design process based on public benefit and not profit. Whilst we have a CBD which doesn't look or function as one, our energies would be better directed at rectifying the failing public spaces, access to businesses and connectivity in and around the city first. Time and again in this conversation I show this image. The lake was never meant to be a wilderness posing as open public space. It is meant to be an integral part of the city, with urbanity reaching all the way to its shores. Better than rejecting any development near the lake we should be demanding something of quality to be built, creating a place of beauty to be enjoyed by not just Canberrans, but the nation. It should be our city’s postcard to the world. Robert Knight Enrico is not rejecting all development, just private development which prevents the lake being used by the public. Griffin/Mahony designed the lake as a democratic space. When Kingston Foreshore was built, the lake front was blocked off for years. That’s not free access. We can have high quality public buildings right up to the lakefront. I do agree Robert. The Kingston Foreshore is a prime example of “what might have been”... it could have been stunning with lots of green space, easy access to the water, beautiful interesting buildings. While I love living here I hate the fact that all the buildings are concrete and so uninteresting and there is no where to dangle your feet in the water, no park for kids, no public toilets, and everywhere you look more concrete. It has a lovely vibe but this area could have been so much more with better planning and better development. - should further private development around Lake Burley Griffin go ahead? In a word, no. Warwick Penn Bradly, I’ve grown up here and spent plenty of time walking, running, riding, picknicking and BBQing around the lake to appreciate what it is. So much of it is under utilised, inaccessible grassland and scrub walled off from the city by a four lane freeway. If you think about great urban parks and lakes around the world they are all surrounded by intimately connected urbanism. LBG is a confused mess between wilderness, urban park, and ornate landscape to look at as you drive past it at 80km/h. I note that Enrico is not rejecting all development around the lake, just poor quality private development which restricts public access to the lakeside. I agree with him. I just have a problem with the gross NIMBYism of people who want nothing to change, particularly when what we’ve got doesn’t come anywhere close to what Walter and Marion envisioned for Canberra. Libby Oakes-Ash I fully agree with you Libby. When planning a get-together with friends that area is the last we’d pick. Unattractive & expensive venues on top. When reclaiming parts of the lake to allow more development seems to be part of their plan, I can’t put any trust in the government focusing on anything other than as much development as possible. I’m sure Barr will try to tell us how wonderful the development is, but I’d prefer a reasonable amount of land to be reserved for public use as suggested in this article, without reducing the size of the lake. This would be good. No ugly, soulless building around the lake please. No no no. The labour government is determinef to ruin Canberra with more apartments and revenue raisng at the expense of public space. And a kick back or two perhaps. Labor, but yes true enough. But wait till the next election when blinkered Canberrans will vote it in again. God help us! I know I’m in the minority here, but a cafe or two along the lake would be lovely! Regatta point, either side of reconciliation place, The National Library cafe, the Yacht club, Kingston foreshore and The Boathouse not enough for you? Oh and the cafe in Weston park near the nursery. Ruby Stead plenty of cafes on the lake at Kingston Foreshore. Bean and Table, 38Espresso and 7th and Bake all with water views. So there are some options 😄There is the beautiful Deck Cafe with stunning views at Regatta Point, there is a nice little cafe right on the lake at Reconciliation Place, there is the Bookplate cafe at the National Library with a fantastic outdoor space, fish and chips and ice creams right on the lake at the Southern Cross Club, there is the great little van at the Carillion, the Fantastic National Museum cafe that sits right on the water, and a great little cafe at Weston Park with the lake on your doorstep. There are many on the water Flynn. and what is there in west basin? The abandoned pedal boat hire place? Everyone better get in their car and drive drive drive, heaven forbid there’s anything over that side. The cafes that are there just aren’t great, vibrant cafes that embrace the gardens and the lake! James Forge No, not enough. Or rather, not convenient or reasonably priced enough. The National Library! Who’d want to go there just for a coffee. Libby Oakes-Ash The readers here are talking about the other side of the lake, where the paddle hub is (used to be?). The Kingston Foreshore doesn’t have a nice view, just a bit of water & apartment buildings all over. Daniel Königs I hear you Daniel. Nothing there. The entire lake is a popular running/walking route for many people. I'd much prefer to exercise out in the fresh air, with a nice view of the lake, than in a gym staring at a treadmill screen. But this govt is so development-mad, Abril. Time to dish this mob out of the Legislative Assembly for good with few exceptions. Yep, too much development already. That’s for sure & endless inconvenience to the driving public. Barr should soon become history in Canberra. I wonder what his opinion is of the current area, unused car parks, a foreshore that is barely used and has become a home for homeless people to camp? Or perhaps we can recognise that most people want to see the foreshore developed to create a valuable and vibrant waterfront precinct? You have nailed the issue on the head Chewy that is conveniently ignored by the ‘no at all costs’ brigade. Yes we need clearly reasoned consideration of how and what should be developed in the city, and more specifically around Lake Burley Griffin. But that area proposed for development is an absolute waste of space in its current form. It has no value in its current form. Proposed development of the area should be put up against other approaches that could be utilised for the space. Its a bit like the ramblings of Paul Costigan about the ‘Dickson Parklands’. Trying to portray something as currently having substantial value to the community, when in reality what is there does not. None of my comment condones what is proposed for the space – but to me its an obvious area where options should be considered, as it is a prime location in terms of its geographical location in the city, and currently is a completely under utilised part of the city. The work so far around the area with public space, walking paths, picnic areas and exercise equipment is being well used so there’s obviously a need for a well thought out development to be undertaken. Perhaps those who are absolutely opposed to any type of development should ask themselves how they see Canberra growing into the future. What ideas would they have to accommodate this growth? The thing that annoys me the most is when they talk about the natural lake views and amenity provided by the lake and foreshore. It’s a man made lake, if their type of anti development attitudes prevailed in the 60’s, the lake and beauty that they want to “protect” wouldn’t even exist. I think that the foreshore and west basin activate the lake, but no further lake development should be allowed. But Canberra is full of vocal NIMBYs afraid of progress who would rather suburban sprawl twice as far as Tuggeranong. What is on the waterfront currently lacks any architectural merit so not allowing more mediocre buildings blocking the lake is a good idea. LBG wasn't supposed to have buildings around it. What's with the blue Mickey Mouse down by the lake?